Thanks to industry pros’ such as Gregg Ritz of Hunt Masters, Melissa Bachman from Winchester Deadly Passion, All Access Outdoors’ Craig Morgan, Fred Eichler of Easton Bowhunting TV and CINCH’s own Jill Gechter, we’ve compiled an ultimate master list of turkey hunting how-to’s. So, whether you’re hoping to score your first Grand Slam, Royal Slam or World Slam, we’ve got the octane boost your hunting game needs to nab the official King of Spring. 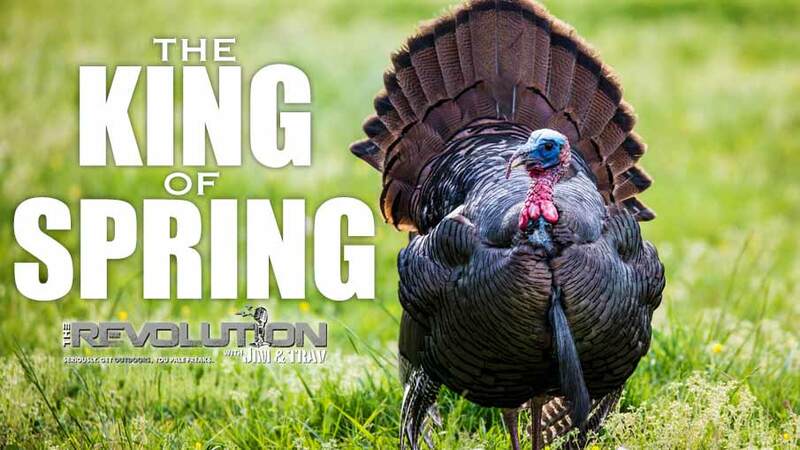 This week’s in-depth turkey guide on The Revolution with Jim and Trav is presented by Outdoor Channel, Sportsman Channel, World Fishing Network and MyOutdoorTV. There has been a significant change in turkey hunting today compared to that of 30 years ago as populations have risen dramatically. Gregg Ritz host of Hunt Masters on Outdoor Channel says the birds have changed and while there may be more of them, they aren’t as easy to hunt as they have adapted to the increase in predators. Tune in and find out how Gregg scouts, why he uses trail cameras and how that information can put you in a position to bag a tom before he’s all henned up. He’ll also discuss how whitetail management has benefited the wild turkey and how you can help Gregg represent the outdoor lifestyle by voting for him in The Ultimate Men’s Health Guy Search. One of the biggest accomplishments a turkey hunter can achieve is completing the World Slam. Fred Eichler, host of Easton Bowhunting TV on Sportsman Channel, did just that this spring – and with a recurve bow. Fred stops in to talk with Jim and Trav about the final leg of his World Slam journey, hunting the ocellated turkey in Central America. He’ll dish on the challenges of the hunt, one of the biggest being the language barrier between he and his guide. He’ll also talk strategy and why ambush style hunting from a blind ultimately clenched the Slam for him when calling didn’t work. Viewers will get to see this ocellated turkey hunt in the next few months on Sportsman. Country music sensation and diehard outdoorsman Craig Morgan is the host of Craig Morgan All Access Outdoors on Outdoor Channel. Don’t miss out as he joins Jim and Trav this week to talk turkey. This season he is using the Browning Maxus and with a few birds under his belt already in Florida and Kansas, he says that it is a game changer. He’ll also discuss the art of calling turkeys and explain which calls he prefers in different situations and conditions. Finally, he’ll talk about his current tour, the “American Stories” concert experience where each show features special guest Mac Powell as well as military heroes and veterans as they sit on the stage, tell stories and sing songs. Find out more this week. Regardless of the game you pursue, in the end it’s all about your ability to make a lethal shot. Melissa Bachman, host of Winchester Deadly Passion on Sportsman Channel, is hanging out with Jim and Trav this week and she lays out the proper shot placement for hunting turkeys with a bow. She’ll talk about how to avoid the impeccable vision of a turkey, her favorite ground blind, and how she keeps ticks at bay while she’s in the woods. Melissa will also dish on her favorite hunting partner, Pork Chop, and the double bearded Illinois gobbler she knocked down last week.